Motion capture technology has been the bane of Hollywood for some time. The tech has definitely come on leaps and bounds, with pioneers like director Peter Jackson pushing MoCap to its absolute limits. But there is a limit. To date, motion capture generally needs to be done in a studio, away from the hustle and bustle of location-based shooting. This could all be about to change, however, as Technology Review is reporting that something called Second Skin is a cheaper alternative for creating special effects. The suit, coupled with a projector, uses special sensors and reflected light to track motion. The 'near infrared' projector can be used indoors and outdoors and the information can be fed into a computer to create an animation. In short, there's very little setup to do – effectively creating your very own on-the-go MoCap kit. Second Skin has been created by MIT (Massachusetts Institute of Technology). Its creators describe it as: "a wearable fabric to support millimetre-accurate location and bio-parameter tracking at thousands of points on the body. 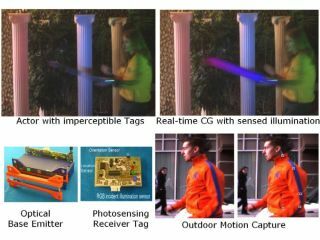 "Such a fabric can compute and predict 3D representations of human activity and use them for a closed-loop control to augment human performance." Although the suit is in its early stages, this type of MoCap, which costs around $1,000, could pave the way for lower-budget special effects movies.